Where Have the Girls all Gone to? Copyright, 1891, by Francis, Day & Hunter. When I looked round and saw not a female was there! I rushed up the stairs scanned the rooms left and right. Said I to myself "Here's a funny set out!" Where are the dear little ones? The dear little, sweet little girls! And to fetch hats and coats were beginning to go. The waiters all grinned, and knew what was amiss. 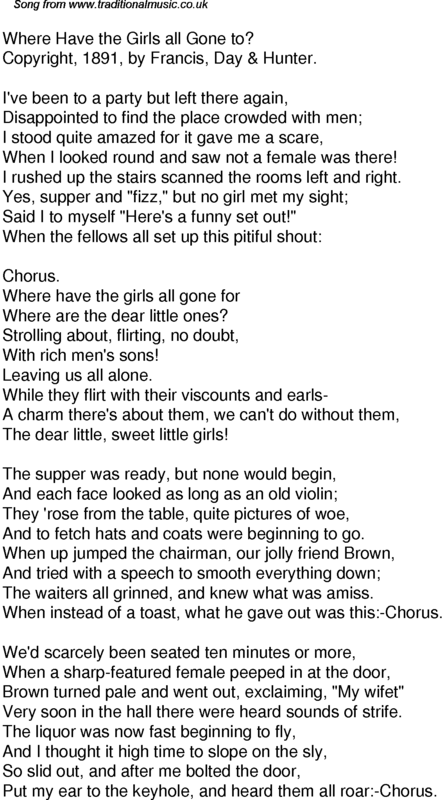 When instead of a toast, what he gave out was this:-Chorus. Brown turned pale and went out, exclaiming, "My wifet"
Very soon in the hall there were heard sounds of strife. Put my ear to the keyhole, and heard them all roar:-Chorus.